Leo, Jack and I went to the coast for a few days while Sara was backpacking up in Washington with our friend Natasha. I knew I had to create some kind of grand diversion for us all in order to keep the good time rolling for three days. Little did I know it was Leo who would create the diversion. The guy is obsessed with surfing. He’s seen Surf’s Up, a kids movie. He’s hiked out to the “surfer beach,” as he calls it, many times and loves to watch. And I’ve caught him practicing surfing moves on the picnic table. It’s pretty much all he talked about for three days. The energy grew and grew throughout the morning. He practiced his “rad moves” for while, then sat wrapped in a towel on my lap and watched the big surfers on a day of gentle waves. Last night, after we got back to Portland, he fell asleep watching surfing videos on YouTube. Sweet dreams. This entry was posted on Thursday, August 20th, 2009 at 1:02 pm. 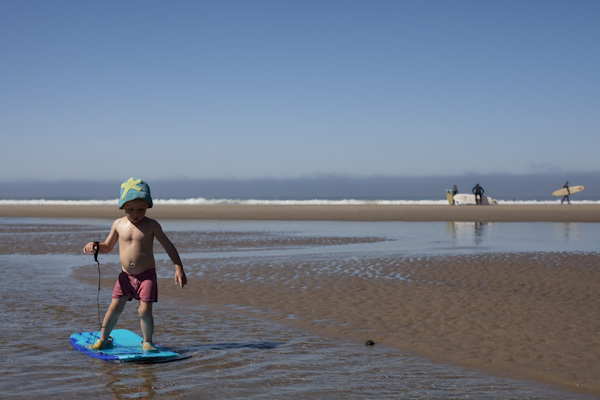 It is filed under Explore, family, the northwest, travel and tagged with coast, labarge, oregon, photography, photojournalism, portland, surfing, tim. You can follow any responses to this entry through the RSS 2.0 feed.